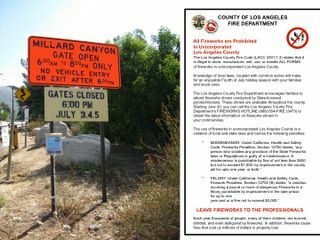 Due to the 4th of July weekend, the Chaney Gate to the Millard Campground will be closing at 6 on July 3, 4 and 5th. Many thanks to so many who are helping with flyers, with patrols, who helped laminate, print and put up signs and will help restock the info box about the dangers of fireworks, smoking and open fires and BBQ's in our forest. Please call the sheriffs if you see any suspicious activity.